I went to the Master Gardeners’ Green Thumb lecture on Feb. 19 at Freeman Library and listened to more information that I could every assimilate but I was able to note some interesting things on tomatoes which is my chief spring crop. They said to plant after the last day of possible freeze (March 5th) and then try to get your tomatoes to set or blossom before the night temperature reaches about 75℉. (in early June) for larger tomato varieties. I recommend Celebrity, a medium sized tomato, which produces in 69 to 80 days. When it quit producing I pulled it up. The MG’s recommended two cherry tomatoes: Sweet Million and Juliet. The cherries are able to keep producing into the summer and possibly into the fall. I have grown Sweet Millions (55 to 68 days) before and Juliet was highly touted by the Master Gardeners. Juliet produced more fruit than any other tomato variety in Montgomery County last year. The MG’s recommend an organic fertilizer called Microlife. The tomatoes and Microlife are available from Maas Nursery on Toddville Rd. in Seabrook. I was impressed with the tomatoes I bought recently. Some of our gardeners buy composted cotton burrs and compost tea there. If you are interested in making compost tea, the directions from the Master Gardeners are in my church office box. 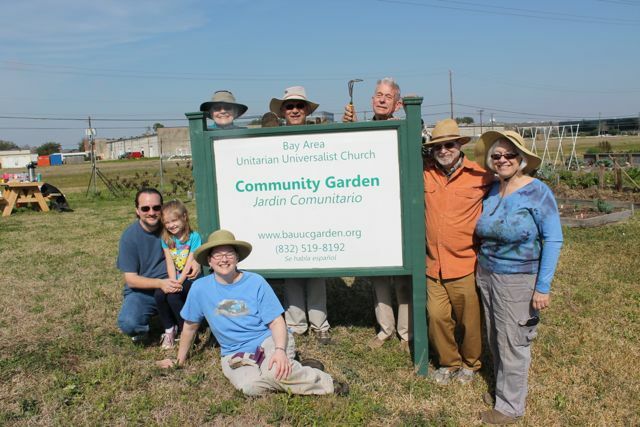 The next garden workday is on March 14 from 8:30 to 12:30. Join us! Our Saturday workday started off chilly but bright. Twelve stalwart gardeners: George, Gary, Fran, Nathan, Jill, Emily, Allan, Christopher, Rowlan, Jane, David, and Elaine turned out to begin preparing the garden for spring planting. Most of the effort went to digging and pulling the pesky grass found on three badly overgrown beds. Gary and Allan were heroes of the day by turning over the soil in several beds. One crew meticulously pulled weeds from around the dewberry and grape vines and then finished off with spreading mulch to prevent its return. George installed new boards on two beds, killed fire ants and hauled off the old rotted boards to the dumpster. There’s a lot more to be done. The next workday will be Saturday, March 14th, 8:30 – 12:30. Volunteers are needed to work with George and Nathan to prepare two production beds, once or twice a month. These beds will be used to grow vegetables for ICM and Bay Area Turning Point and help fulfill our outreach goals to the community. This week George and I made a list of tasks to be completed at the workday and George got a head start on weeding. We removed an invasive tomato plant from a production bed that must have weighed a half a ton. We also got a head start on removing limbs and trash from the compost bins. I will mow between the beds next week and George will pick up lumber for replacement of rotted boards. I hope to upload some photos of the garden from January 2015 so we can see what the beds looked like before the workday. Please come out and show some LOVE for our garden on Feb. 14th!